Composing an informative and touching (not cheesy, though) wedding invitation can be challenging. You have to keep it clear and simple, so the recipients immediately know what it is about. It has to appeal to a wider audience, as it will be sent to people of different age groups and both family sides. It is important to be detailed but not too formal. 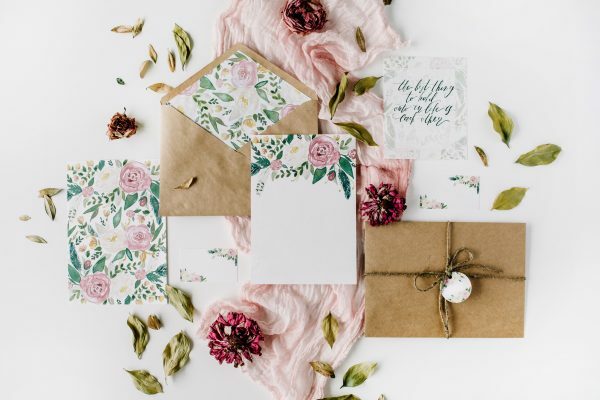 Below are some key points you should make part of your wedding invitation. At least, if you want to avoid any confusion. Include the venue address and the breakdown of the day in the wedding invitation. If you haven’t set the exact timings yet, at least mention the course of the wedding. Will there be a ceremony with a reception and a party afterward? Or just a ceremony with a reception? What kind of a wedding will it be? People like to know what is going on at an event they’ve been invited to. It will also help them prepare for the wedding, e.g. book a hotel or organize transportation to the venue. And it will save you some time answering (extra) questions. It might seem quite obvious. But some people don’t realize how much preparation is needed for a wedding. And that this preparation kind of depends on the number of guests. Hence, some invitees will forget to answer. With best intentions of trying to get the exact number of guests sooner rather than later, make sure to clearly state that a reply is required. And feel free to send reminder e-mails. Insert a meal preference line in the wedding invitation. If you are planning on serving more options, let your guests choose one. If you don’t know the menu yet or will serve the same meals, then just add a line for the guests to specify any intolerances. This way you will be able to advise your caterer about any specialties. It is important to specify whether an extra guest is welcome to join. Especially if you are inviting international friends. Different cultures different customs. In some places, you are expected to bring someone: In other places, however, only the invitees themselves are welcome to join the fun. But even if you encourage your guests to bring a friend, make sure it does not seem like they are obliged to do so. Simply insert a line stating that guests are welcome to bring someone. And that you would like to know their name and dietary preferences as well. If you have any kind of wishes or requests, do make that clear in the wedding invitation. For example, let you guests know if there is a certain dress code. If you have a gift registry, write down the link to a website. It will save you precious time answering questions later!